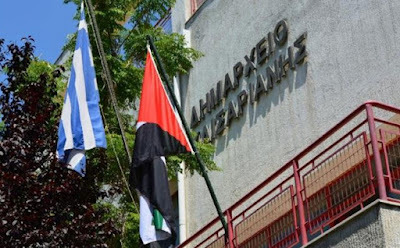 In a symbolic gesture of solidarity to the struggle of the Palestinian people, the Municipality of Kesariani in Athens raised the Palestinian flag alongside the Greek one at the City Hall's facade. In a statement, the Municipality points out that "on the occasion of the 1948 disaster, the "Nakba", we express through this way our solidarity to the Palestinian people who, for decades, asserts their own free state, demanding the ending of the israeli occupation and the foundation of a Palestinian state." The Municipality strongly condemns the recent massacre of Palestinian demonstrtaors by Israeli armed forces in Gaza and denounces the policy of the Greek government which continues the collaboration with the "state-murderer" of Israel. Kesariani is a historic suburban district in eastern Athens. In 1922, the area became a large camp for refugees driven from Asia Minor. During the Axis occupation of Greece, the Kesariani rifle range became the site of the execution of 200 heroic communists by the Nazis. This mass murder took place on the 1st of May 1944.